We are delighted to welcome you to our practice and look forward to serving your dental needs. 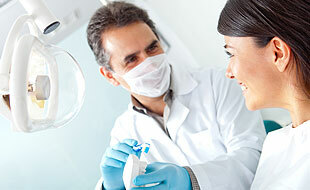 Our goal is to help you feel and look your best through quality dental care. We look forward to serving you as a patient with the use of the latest techniques and technology available for the general implants and cosmetic dentistry. In addition to I. V. sedation (Sleep Dentistry), we maintain an oustanding full service operation in all levels of dentistry to ensure you the best possible care. Please ask if you would like us to improve your smile utilizing any of our cosmetic procedures, which include veneers, whitening and tooth colored fillings. Dr. Sid Ahmadi received his Doctor of Dental Surgery (D.D.S) from Baylor College of Dentistry In Dallas Texas, where he also earned a certificate in Advanced Education in General Dentistry (A.E.G.D). Dr. Ahmadi graduated from Michigan State University as an Electrical Engineer. He worked over six years as a design engineer prior to becoming a dentist. Dental implants are artificial tooth replacements that are used to counter tooth loss. Dental fillings are used to repair minimal tooth fractures, tooth decay, or otherwise damaged surfaces of the teeth. Crowns (or caps) are used to restore teeth that have lost significant structure due to disease or fracture. Clear Correct uses a series of clear aligners that are custom-molded to fit you. Teeth whitening is the most commonly requested cosmetic dentistry procedure. Very impressive. Dr. Ahmadi took the time to explain my dental needs and solutions. The staff was very helpful, providing info and assistance. Dr. Ahmadi and his staff are the sweetest! I am not a usual fan of going to the dentist, as most of us are not, but him and his staff make you feel welcome and at home. They all go above and beyond to help explain the treatments and insurance benefits. The office is cozy and does not give off the usual dentist feel. I will not go anywhere else and recommend all my family, friends and co-workers to at least give him a try! And you'll never go anywhere else. He is a very good dentist and I hate dentist so that is saying a lot. Great staff and awesome service! I had an excellent visit. He was very thorough and his bedside manner is awesome. The visit did not feel rushed. I have a new dentist. KUDOS to Dr. Ahmadi!!!! Very professional doctor and staff, felt very comfortable. Dr. Sid approaches dentistry with the professionalism of an engineer, of which he is. I highly recommend him as a dentist. Excellent. Best dentist I have been to. Great experience! Dr. Ahmadi was so careful and understanding of my anxiety about being at the dentist. For the first time I am actually looking forward to my next appointment. The staff was wonderful and caring as well. I highly recommend his services. Great Doctor! Went over everything where I could understand. I was very satisfied with my visit. Everyone in office was very nice and made you feel comfortable. He and his staff are very nice and professional. His dental hygenist is the best. Made my visit very comfortable and everyone there was very helpful. I would recommend Dr. Ahmadi strongly.